Five Star Service, Random merchants who provide excellent customer service as verified by our secret shoppers. Traditional Turkish food that offers the BEST delivery service. We give this one 5 GOLD stars! 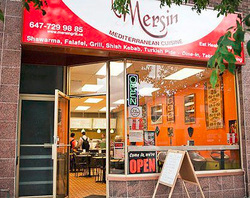 Mersin Mediterranean Cuisine uses the freshest ingredients to prepare its food. They take pleasure in providing service with a smile. Anytime you wish to rent a car in Toronto, all you need to remember is Advantage Car & Truck Rentals. They guarantee the best rate of all the major car rental companies operating in Toronto. No "hidden" charges will show up on your final bill. The only dental office (for children and adults) you will ever walk into a bit apprehensive and leave with a smile. Great staff, professional and courteous with over 30 years of experience. Conveniently located at Wilson and Bathurst, just minutes from the 401.